Greetings from a layover in Denver. 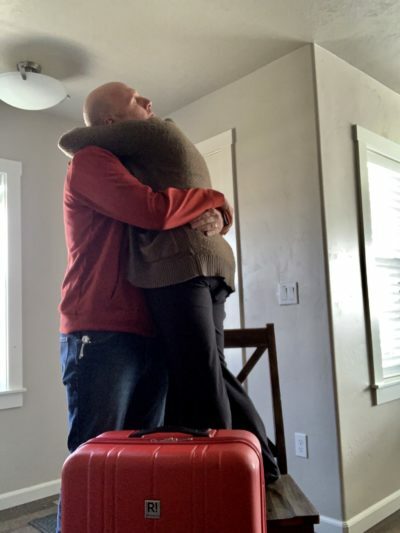 I left Boise this afternoon and had to say goodbye to my hubby for… a long time. He will stay at MAF headquarters while I go back to the kiddos. Layovers stink. I don’t mind them as much when it’s like 45 minutes. I’d even rather have to run to my next plane than have to sit here for 3.5 hours. I went to every spot where Southwest had another Chicago flight hoping and praying that I could get out earlier. No luck. So here I sit, being the cliche blogger, plugged in to the electrical outlet, earbuds in, drinking a Starbucks latte. Who am I?!?! ;) Bring me PJ pants and a Dunkin Donuts black coffee..STAT! As I have stated in the past, my kids say my signature move is that I can make a devotion out of anything so I figured that’s what I’ll do with my time here today. I feel like our lives could be in a constant state of layover if we let them. I’m waiting for my plane so I can just get where I wanna be. But, when I get there I’ll be waiting for the day that I get to see Jack again. When Jack gets home I’ll be waiting for that long drive back out to Boise as a family. When I’m back at headquarters I’ll be waiting until the day we get to go back to DeMotte to see family and friends. When I get back there all the packing will need to be done and I’ll be waiting for the day I get to be settled into our language school house and when we get there, I’ll be waiting to move to our final home in Sentani. And on and on. What if I chose to live in this moment. What if I choose to take this time of layover to catch up with a friend over the phone, finally text my gratitude accountability group for the first time in several days (sorry gals! ), or write a blog to share some of the things that God might be trying to teach me in this moment and possibly inspire someone else. What if you choose to live in this moment? Today lets choose together to to take advantage of whatever layover God may have us on in this moment. Don’t get me wrong, I’m still gonna be longing for that hug in the picture above like CRAZY. But, I will choose to see the opportunities in front of me while He’s gone and take hold of them. This waiting is not a mistake. It’s an opportunity for growth. I’ll choose to take it. Will you?